India's frosty relationship with China seems to be in a never ending circle of news and the latest chapter in the story comes from Renewables Sector. 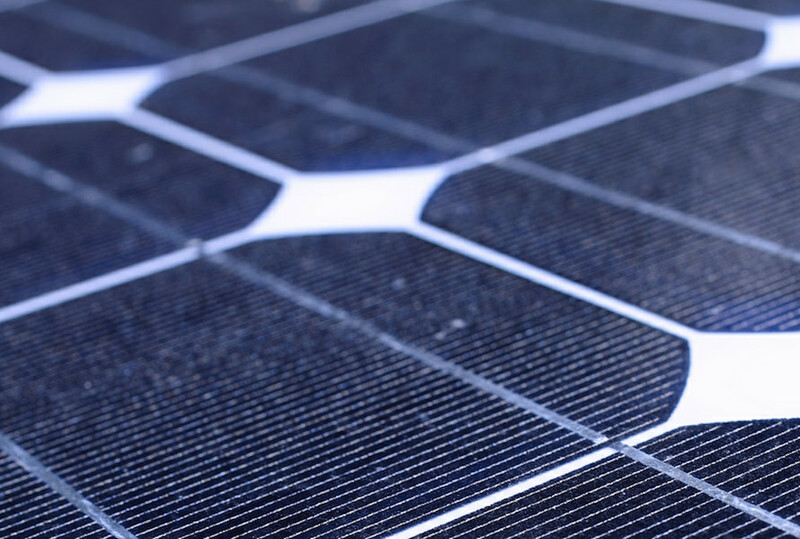 The Ministry of Commerce & Industry has filed a petition for 'initiation of Anti- Dumping investigation concerning imports of Solar Cells whether or not assembled in modules or Panels originating in or exported from China PR and Malaysia'. 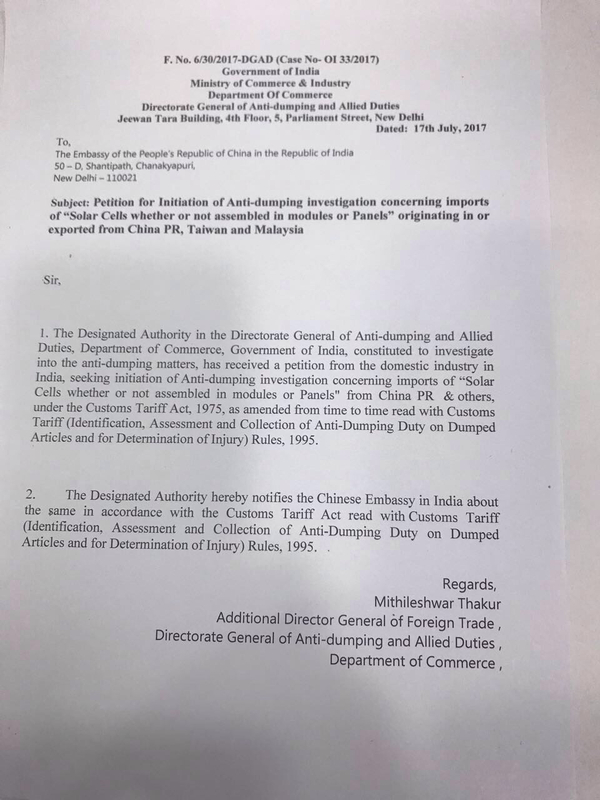 In a letter dated July 17, 2017, Mithileshwar Thakur, the Additional Director General of Foreign Trade informed the Chinese Embassy in India of the move. The petition comes on the back of several mummers that have been going around in the recent past owing to the rather weak performance of the Indian manufactured solar cells in the market, with a large percentage of installers and developers preferring to import the cells from China owing to lower costs. As recent as June 30th, in an article by Economic Times, it was mentioned that the manufacturers had reached out to the Government to help them and impose a 'safeguard duty' on the equipment to help level the playing fields at least in terms of the cost. According to the same article, the manufacturers in India had asked for an anti dumping duty of 10 cents per watt on the modules and cells that were imported. It is a widespread knowledge that of the 5GW+ installed capacity that was commissioned in the year 2016/17, 90% of the solar cells used were either imported from China or neighboring countries like Taiwan or Malaysia. It has been reported that over 1.5GW of manufacturing capacity of solar cells in India has been lying idle simply because of the lack of demand. The Indian Government in the past has pushed the Make in India narrative strongly in the sector, and we saw with the 500 MW Rooftop SECI Subsidy program, it was mandatory to use the domestic modules. However, with India losing the case in the WTO for Fair Trade, it is not beyond the realms of possibility that this time the Government will implement the duty on imported cells. In the immediate term, this would increase the total project cost in the range of about 5-15% in case a safeguard duty of about 20% is imposed. This would also mean in conjunction with GST, which has been recently implemented, in the short term the cost of solar tariffs will go up perhaps back to the Rs 3 mark from the Rs 2.44 that we have seen recently. While this move will benefit the local players, it will create a barrier for global manufacturers from entering the country, which could prove to be undermining for the industry. It would be interesting to see the response and the investigation into the matter, but more than ever before, if Anti-Dumping has to come, this looks to be as likely a period as ever so far.